I love fall. As the days shorten and temperatures crisp, the quiet green palette of summer foliage is transformed into the vivid autumn palette of reds, oranges, golds, and browns. I love me some candy corn. And although too much could rot your teeth out or give ya a coronary, a good healthy dose will do wonders for your spirit. So, thought I'd share some of my favorite candy corn treats. Just don't have them all at once. Wink, wink. Make butterscotch pudding as directed on box. Stir in 20 drops red food color and 25 drops yellow food color. Refrigerate 30 minutes. Make banana cream pudding as directed. Stir in remaining 20 drops yellow food color. Refrigerate until ready to use. Place 1/4 cup banana cream in bottom of 6 (8oz) glasses. Top each with 1/3 cup butterscotch and about 1/3 cup whipped cream. Garnish with candy corn. And here's a card for the taking. 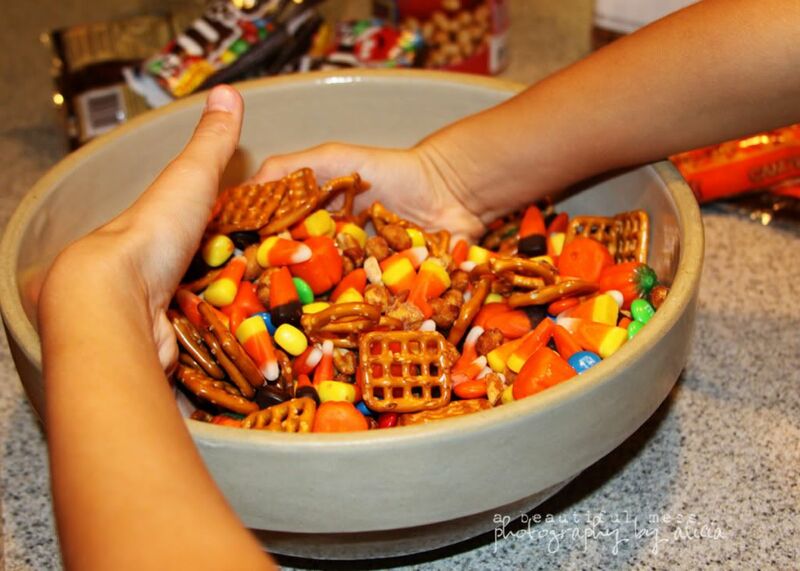 Candy Corn (Sweet 'n' Salty) Snack Mix. This one is fab because I can just grab what I have on hand. It's very forgiving. Plus the kids love to help. And it looks festive on my counter. We didn't make popcorn and didn't have the raisins or sunflower seeds on hand- cause who keeps all that healthy stuff around (kidding of course), but I thought I'd add those in next week when it starts getting low. And last but certainly not least,Candy Corn Bark. Super duper easy and perfect to wrap up and share with a friend. Hope you're off to a great week. I took a few days off for a much needed break to recharge a bit and it did wonders. Happy Tuesday, Y'all! Enter My F21 Gift Card Giveaway!! 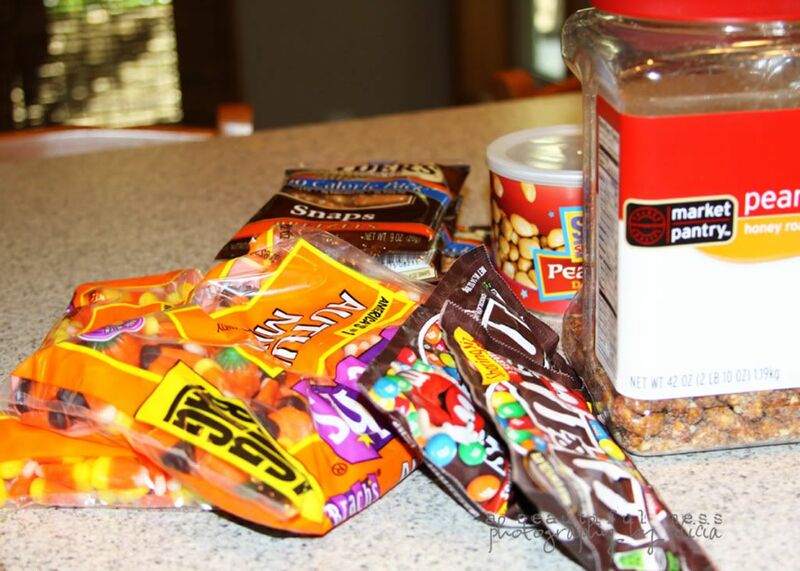 We buy Autumn Mix, then fight over the two chocolate pieces. Just kidding. Sort of. The pudding looks so neat, and the snack mix! Yum! I don't think we have Candy Corn here in Australia... if we do, I've never seen it. I want to try all of these delicious looking recipies, though! OMG! You are a girl after my own heart, Alicia! 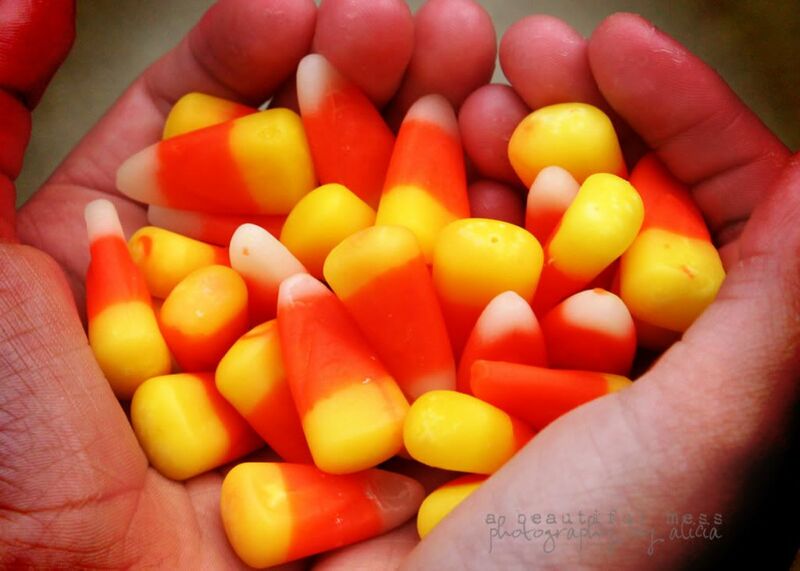 I love candy corn soooo much, it is actually a whole separate nutritional food group in my food pyramid...lol. I got something for ya. Not sure if you have a Williams-Sonoma close to where you live but they have something called Collosal Candy Corn, and it is collosal indeed. It is actually a gummy that looks and tastes like candy corn. It is awesome! And they are like the size of a thumb! I'm sorry ladies. I forget there are so many from Australia and New Zealand, especially for tasty tuesdays. Thanks for the link amanda. And Maria I can only dream of having a williams sonoma nearby. Those sound heavenly! Alicia - you are killing me with these candy corn recipes! I LOVE candy corn but have so far resisted buying a bag because if I do there is no way I can open it with out eating half the bag. I don't think I'm going to be able to resist anymore though after seeing these yummy recipes! Okay. I'm grumpy. It doesn't feel like fall here. It feels like hell, it's been so bloody hot! And I HATE candy corn. It's the one kind of candy I don't like! Grumpiness aside, those treats looked really yummy! The pudding was adorable! I bought caramel apple candy corn on Sat...so good! Love the little parfaits! Thanks so much for hosting another great TT! 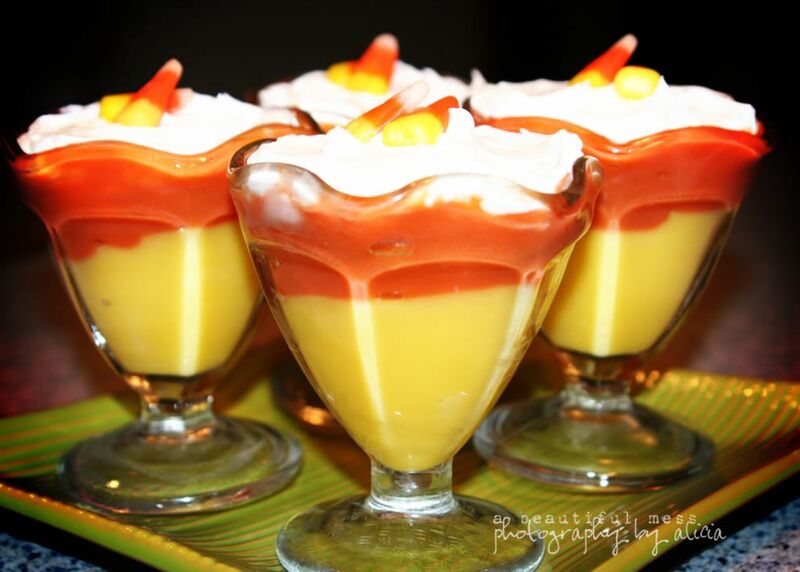 the candy corn pudding looks super cute! but i think i'd like the bark the best! candy corn bark? That's some kind of genius...seriously. I can't wait to try it! We are huge fans of candy corn. In fact, we bought a variety of junk food for family movie night last Friday and the kids raved about it more than anything else. Thanks for the recipes! Oooohhhh we could be such good friends because I LOVE CANDY CORNS!!! holy cow!!! That candy corn pudding and bark looks soooooo delish! I am so going to make this! Thanks for adding calories to my already huge body! What a good friend you are! Wow, that is amazing! I have a whole new appreciation for candy corn!! wait...i am an addict too! last year i did a whole obsession thing on candy corn...how not all candy corn is created equal--i took it off my blog when my mom got concerned (haha!). what a great post and i love those puddings..how adorable! I'd like to take a virtual taste testing...you're just feeding the addict! Yum. I LOVE candy corns....love, love, love them! How fun!! I love candy corn and I love your candy corn recipe ideas! Especially the pudding! YUMMY!! Okay, that candy corn pudding is too cute! We don't get that candy corn here! In fact what we call "candy corn" is actually popcorn with a colourful sugary coating on it. So wow. Here I have just had a cultural lesson. And it looks amazing, epecially that sweet and salty mix! oh my, those recipes look tasty! I really want to try the first one, it looks splendid!! These all look way too yummy! Candy corn is hard to find in England too, but every once in while I get lucky and find some - then I buy lots of it!! Thanks for hosting and have a great week! What fun ideas for the season. I'm adding the first recipe to my menu for our annual halloween party. I'm not a huge candy corn fan but those puddings look amazing! Your recipe card is precious!! What fun mixes. I am so excited for Halloween parties when I can serve these sorts of things! Love me some candy corn! The bark looks super easy and yummy too! I am very, very lucky that I did not catch candy corn-itis. Caramel apples though? Totally different story for me. You have gained the weight I have lost just looking at this post!!! :) Those look so good!!! You have the best ideas! 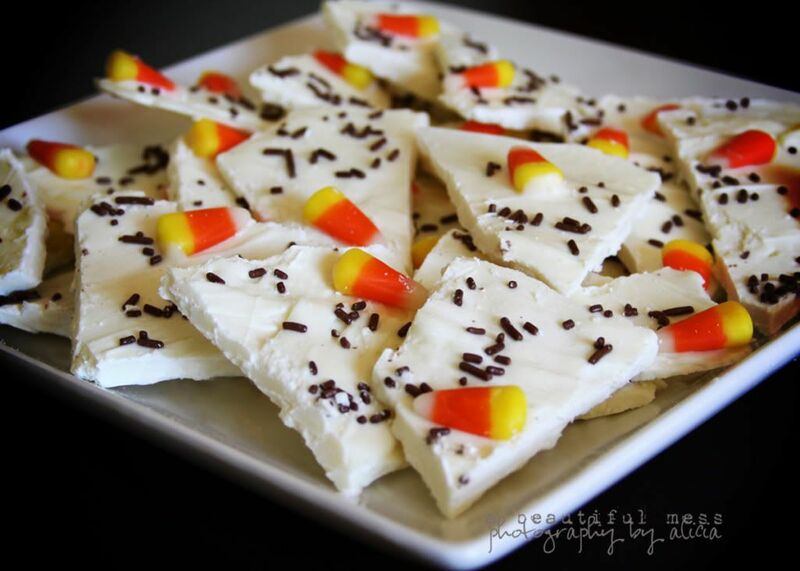 Candy corn bark! What a great idea! white chocolate + candy corn. Holy YUM. Aw candy corn! It really is a wonderful thing and can do so much for you! Every year I buy enough to last me for the whole next year! I love all the recipes, can't wait to try them! 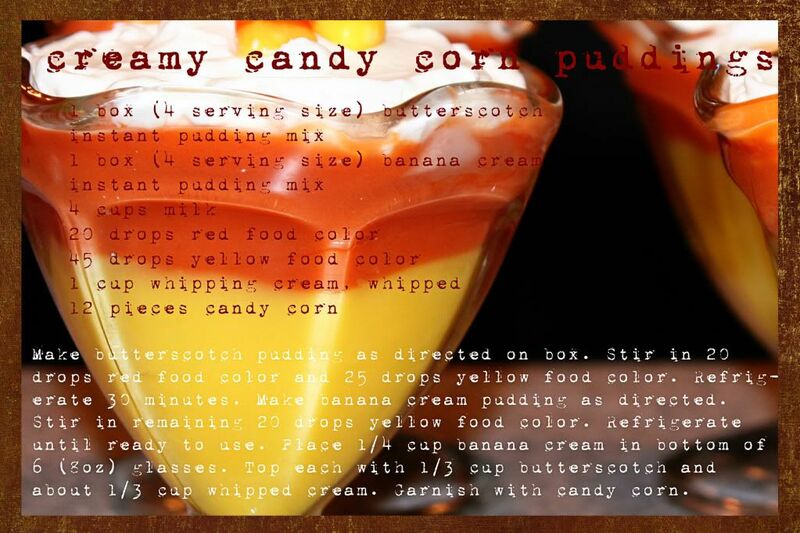 I'm making that candy corn pudding for dessert tongiht! YUMMY and it looks so festive and like FALL is here! LOVE candycorn! Following you on GFC and NetwrokedBlogs now! I love candy corn! All your ideas are cute, but especially the pudding. I bet that would be a hit with kids especially, though as an adult, I'd love it too. I love all your candy corn treats!!! They look delicious! Holy moly, someone's addicted to candycorn! lol These look great Lish. My mom loves candycorn. I'll pass these recipes on to her! my sister and i always joke that candy corn is our crack bc it is so addicted! i am definitely going to give that mix a try! 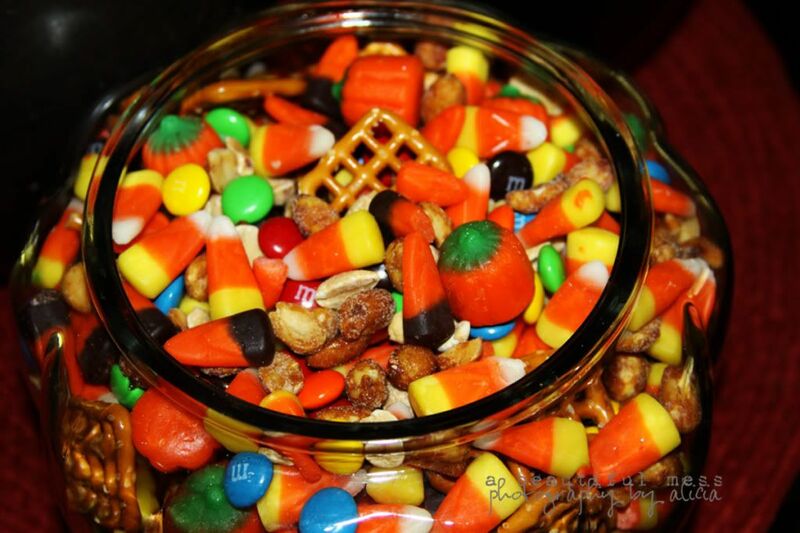 I love your version of the snack mix - and that Candy Corn bark - oh my!! I love candy corn as well. i'm totally trying all of these. I love you for posting this! I live for the Fall and candy corn lol. My husband and I just has this debate the other day he claims nobody liked candy corn as much as me and that the whole world though it to be disgusting lol. I guess this will shut him up! Candy corn rules thanks for the recipe ideas! Love, love, love candy corn...I can eat it till I get a stomach ache! Sweet and salty mix is now a must at my house! Thank you! I don't really like candy corn but all those things do look pretty yummy! Such a great idea! I can't wait to put something together, my kids will love it. My piano students will too... I always have a candy dish out for them- now they'll have something salty too. Yum! You are makng me hungry for candy corns and its only 7am here! :) I'm going to have to give the pudding a try! What fun ideas!!! I wish I had some of the mix right now!! !